The Dag van Respect (Day of Respect) together with Cordaid Kinderstem (Voice of the Child) in the Netherlands started in September 2012 a Twinning school program to develop intercultural exchanges to promote respect. The idea is to directly connect Dutch school children with Tri-people (the settler group, the Moro and the Indigenous B'laan tribe) school children in the Philippines. Pasali Philippines (as a partner of Cordaid) is coordinating the part of the school children in Mindanao. With this Twinning program, partners developed a series of creative lessons for the school children to promote respect for each other and each other's culture, using various means of expressions such as discussions, shadow puppetry, and dance. Here in General Santos, schools and children from three barangays of General Santos, Mindanao participate in the program. The Culmination Day is on November 20, 2012, when children in the Netherlands and 157 children here in the Philippines will have a very festive meet and greet through Skype. The first phase was piloted in three schools: San Jose Elementary School, Labangal High School and Tinagacan Elementary School. In 2014, there were 7 additional schools, 3 in General Santos: NASA Elementary School, Bawing Elementary School and Banisil Elementary School and 4 in Palimbang: Kolong Kolong Elementary School, Milbuk Central Elementary School, Kanipaan Elementary School and Palimbang Central Elementary School. 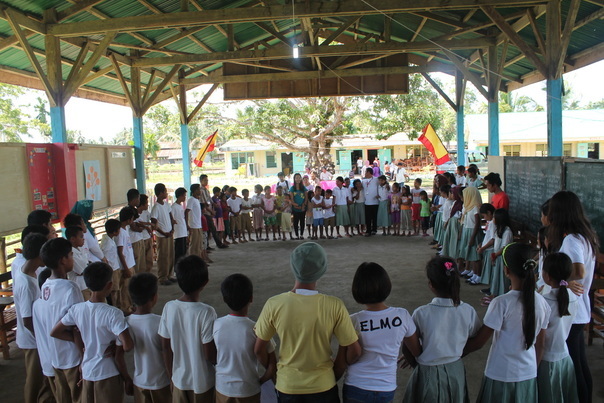 To date, the 2nd phase Respect program was already conducted in 7 schools of General Santos and Palimbang with total participation of 321 students from Tri- people children (Moro, Indigenous People and Christian settlers) classified as Maguindanaon, Badjao, Maranao, Tausug and Samal for Moro children; Cebuano, Ilonggo and Ilocano for the Christian settlers and Manobo, B’laan for the IPs, with an average of 50 participants in every school with the active participation and support of teachers and parents. "Migrants’ initiative transforms community through enterprise, technology and people empowerment."